You know how it is with recipes. Sometimes one sounds weird but turns out amazing, and other times something amazing turns out not quite the way you were expecting. In the continuing saga of “you win some, you lose some” in the Quantum Vegan kitchen, I give you chili mole. 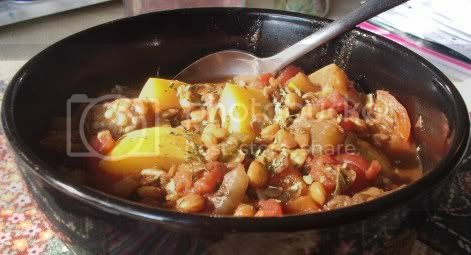 This one’s from Appetite For Reduction and was meant to be eggplant and lentil. I didn’t have quite as much eggplant as it called for, so I used half eggplant, half summer squash. This, however, didn’t have any adverse effect on the way it came out; in fact, I liked the extra added yellow of the squash quite a bit! I’m also a fan of chili with cocoa powder in it, like the Cook. Vegan. Lover. quinoa chili. 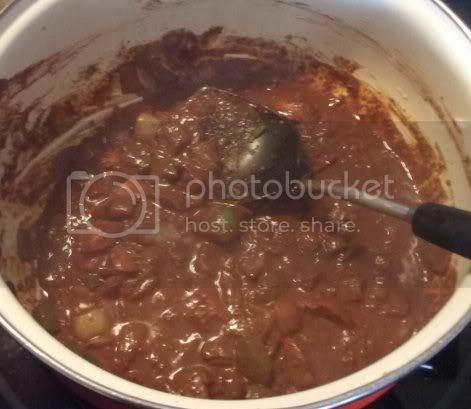 In fact, there really wasn’t anything in the chili that I didn’t like, and I’m still having trouble putting my finger on why I didn’t enjoy it as much as I thought I would. It looks like a nice rich sauce, and indeed it was, but there was something missing. Maybe it’s me, but I like chili to have a kick. I expect jalapenos or cayenne or something in a chili recipe. There was a sidebar suggesting the addition of hot pepper flakes, which I ignored, perhaps unwisely. I don’t want to put this recipe down, because it did have a good combination of flavors–just not the sort of flavors I like in chili. 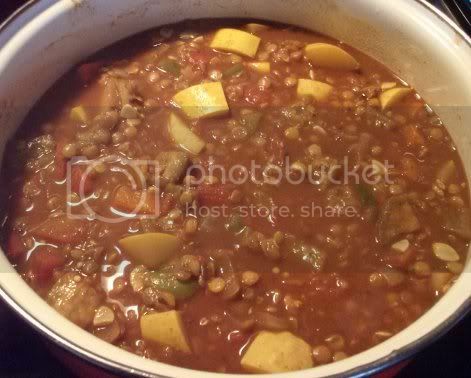 With the lentils, eggplant, and diced tomatoes, it seemed more like a stew to me, which might explain why it didn’t go terribly well over rice. I would, however, enjoy the same combination with jerk spice instead of mole sauce, with cornbread or corn muffins on the side. Lentils need a good mix of flavors to go with them, and I’m pretty sure something like the spice mix from the roasted jerk veggies in The 30-Minute Vegan would do the trick. All in all, though, this recipe wasn’t a winner with me. 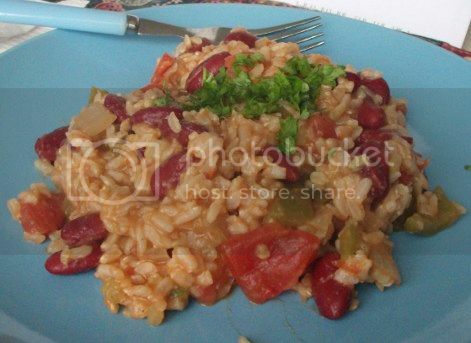 I had better luck with the creole rice I made a couple days later. I was in the mood for beans and rice, but not a recipe I’d made before. 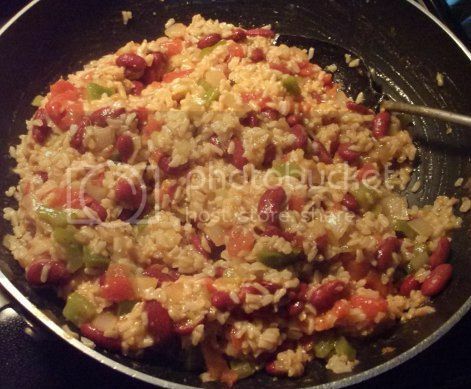 Vegan Fire & Spice has a recipe for brown rice with creole sauce, which turned out to be very easy to adapt into a rice and bean dish. 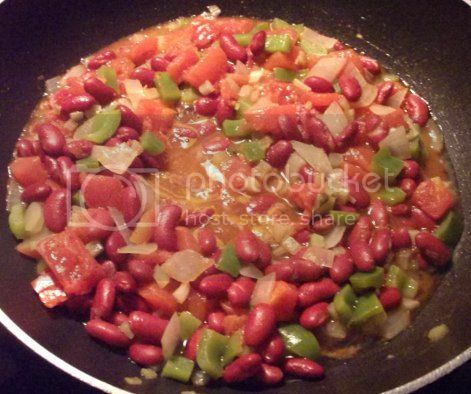 All I had to do was decrease the amount of rice from 2 cups to 1 1/4 and add a can of kidney beans, and ta-da! 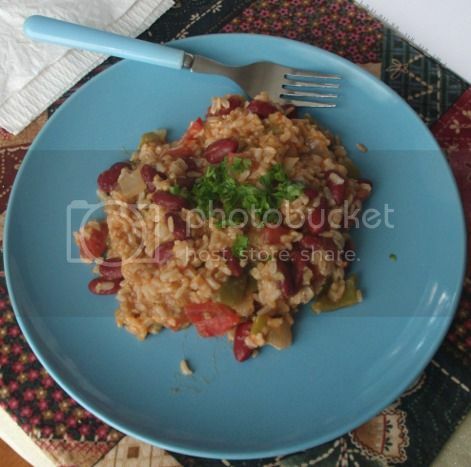 Creole beans and rice! The sauce was pretty unique…there was some minced celery in addition to things like bell peppers and onions, plus lemon juice, cider vinegar, filé powder, a little agave, and a few other things to give it a creole flair. Ever since I started cooking on a regular basis, I’ve liked trying things that are a bit different from “the norm.” I had enough of the norm before I was vegan! The most exciting part? Garden-fresh parsley! A lady at my church gifted me with a couple of parsley plants a while back and, after a bit of a rocky start, they’ve taken off in the garden and are a healthy bright green. I love being able to wander outside and grab things fresh for dinner. It made a great finishing touch for this spicy rice dish. Question for the comments: What was your most disappointing recipe experiment?